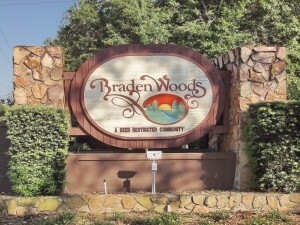 Country-style architecture and oversized wooded home sites are the hallmark of Braden Woods, a community that offers privacy in a wonderful family-oriented setting. Through its homeowner association, the community is dedicated to the preservation of its natural beauty, accentuated by majestic tall pine trees. Savor a pristine neighborhood where community pride is evident all around you. Proximity to Interstate 75, the Lakewood Ranch Main Street, and the River Club Golf Course creates a perfect location where nature blends seamlessly with all of life’s favorite conveniences. Braden Woods redefines gracious country living.